There are a number of ways to use account payments in your site, but many businesses simply want to allow their clients to buy products on house credit. Depending on your business’s policies, clients can purchase account credit ahead of time and use it on a future order, or accrue a negative account balance and pay it off at a later date. You’re free to use just one of these options, or both together—the choice is entirely up to you. In the article that follows, we’ll first look at how to set up these account payment options, then dig into how these features can best serve both you and your clients. Creating payment methods requires the owner login, or access to the “Set up payment methods” staff permission. To create an account payment, staff must have the “Pricing options, account credit ” staff permission enabled. Account payment: An item you create in your site that a client can purchase using cash, a credit card, check, etc. The purchase results in account credit. Account credit: Credit that can be used to pay down a negative balance or to create a positive balance for use on future purchases. Purchases on account: – A client can purchase a service or product using their house account, similar to running a tab. In Retail, purchases on account are made using the Account payment method. Account balance: – A client’s house account balance, which can be negative, positive, or $0. How do I apply a credit on a client’s account if they overpaid? If a client has overpaid for an item, you can return the purchase and store the overpaid portion on the client’s account as house credit. First, return the purchase to Account. This places the full value of the transaction in their house account. 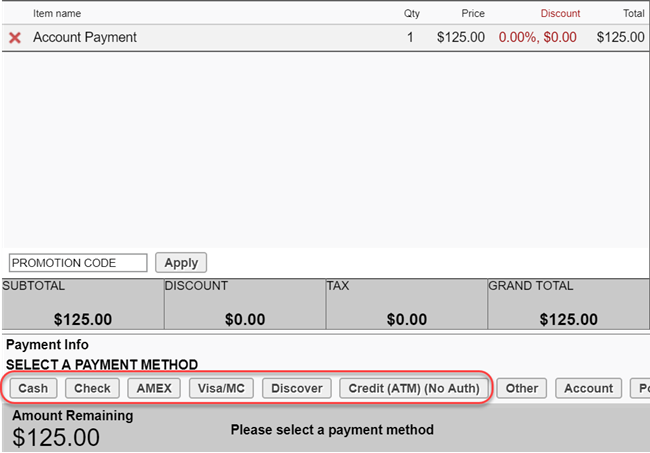 Next, re-process the original transaction in Retail—but select Account as the payment method. This will use up the account credit from the original sale while leaving the overpaid portion on the client’s account as store credit. Selling account credit allows a client to use a positive balance in their house account to make purchases later. Learn how to set up an account payment and sell account credit below. To create an account payment, staff must have the “Pricing options, gift cards, account credit, contracts packages” staff permission enabled. To sell account credit, staff must have the “Complete sales transactions at POS” staff permission enabled. Go to your Manager Tools screen, and click Account Payments. Enter the name of the account payment item in the “Description” field. To allow for customization in Retail, we recommend keeping the Selling price and Credit amount set to $0.00. Place a checkmark in the box beside Force price and credit fields to match in Business Mode. Place a checkmark in the box beside Allow clients to choose the amount. You may select Sell online if you’d like to allow clients to purchase account credit in your online store. You may select memberships in the “Members Only” box if you’d like to only allow certain members to purchase account payments. Go to your Retail tab. Pull up the client you’d like to sell the account credit to by using the Search field. On the right, click Payments/Gift Cards. 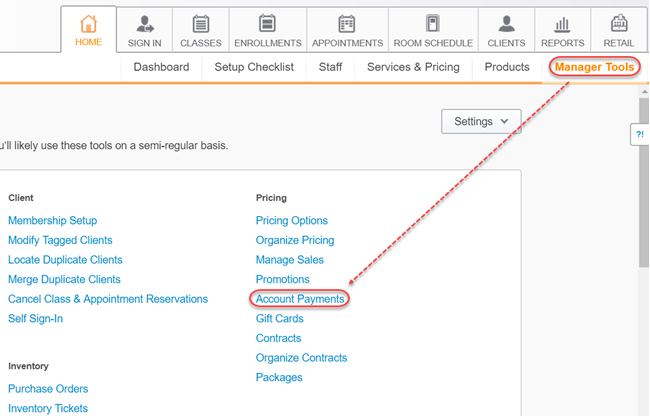 Select the account payment option in the dropdown menu. Type the amount of account credit the client would like to purchase in the Price field. Click outside of the “Price” field. This will refresh the screen and auto-populate the “Credit” field if it was set to match the Price field. 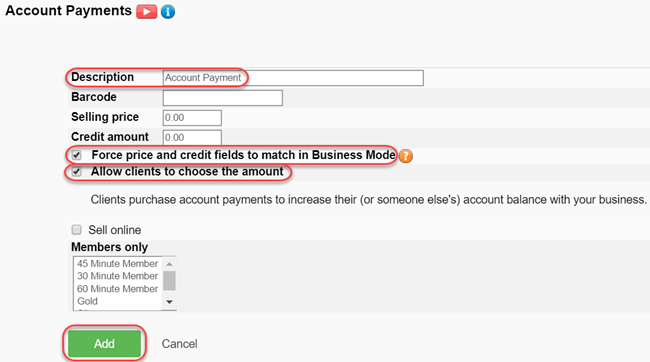 Type the amount of account credit the client would like to purchase in the Credit field if it hasn’t auto-populated. Choose the payment method the client is using to pay for the account credit (e.g., Cash, Credit Card). As a result, a green dollar icon and the amount of account credit will appear near the client’s name in Retail; indicating that they have available account credit to use. You may use the client’s account credit for future purchases by selecting Account as the payment method in Retail.